High end, luxury aptmt, unique position with everything on your doorstep. High end luxury holiday home, unique position with everything on your doorstep. Newly renovated, located in the very exclusive Canford Cliffs, yards from village centre and its delightful choice of cafes, bakeries, restaurants. 10 min stunning woodland walk to award winning Sandbanks beach. Ideal luxury family holiday with a perfect location to enjoy the beach and entire holiday by foot. As recommended by infamous onlinestylist 'coastal life'. Automatically discounted prices for 7 nights plus. A victorian building, lovingly restored and renovated in June 17 with a perfect location to enjoy the areas of Sandbanks, Poole and Bournemouth. Whilst oozing character and charm in its exterior appearance this property boasts a modern/classic interior with new, quality, high end furniture and fittings throughout. 2 beautifully appointed double bedrooms (1 with Juliette balcony) incorporating built in wardrobes, dressing tables, bed side tables and double beds and flat screen smart tv in main bedroom. Additional quality fold away single bed in main bedroom- please provide 7 days notice if required to enable assembly and fresh bed linen ready for your arrival. All feather free, highest quality mattresses and bed linen.. Upon initial arrival whilst an unloading of suitcases etc is possible in the main road, permanent free parking is provided 100metres down the road in The Cliff restaurant/pub car park. Outstanding dual aspect kitchen/living room with sliding patio doors secured by wrought iron railings, fully equipped kitchen with AEG appliances, dinning table and chairs, highest quality leather sofa and armchairs facing flat screen smart tv and not to forget a small desk area for those who cannot leave their work behind! The hallway area provides a laundry cupboard housing a combined washer/dryer and night safe for your valuables. Stunning shower room and separate cloakroom all with high end Duravit fittings. This property sits adjacent to but completely independent of its sister property which is also available for rental, providing a further 2 bed apartment which may be of interest to those with larger families. Outstanding attention to detail and quality throughout, located in an upmarket, quiet road less than 5 minutes walk from numerous renowned eating and drinking establishments. 10min delightful woodland walk to the beach and adjacent to the world renowned Sandbanks peninsular. Discounts available for 7 night stays and longer. Beach Retreat won't disappoint, don't just take our word for it check out guest reviews! Please note that all check ins are from 3pm onwards and check outs must take place at the latest by 10am as our cleaners are booked for 10am. Entire holiday apartment is available to freely access but in particular one of the many attractions of Beach Retreat is its location. Enjoy breakfast at Loch fyne or Harrys bar, wake up to fresh coffee from the coffee saloon, peruse the freshly made delights at Oxfords bakery who will gladly prepare your picnic with a range of artisan breads and fresh Danish pastries-all within a 2 min walk of your apartment. 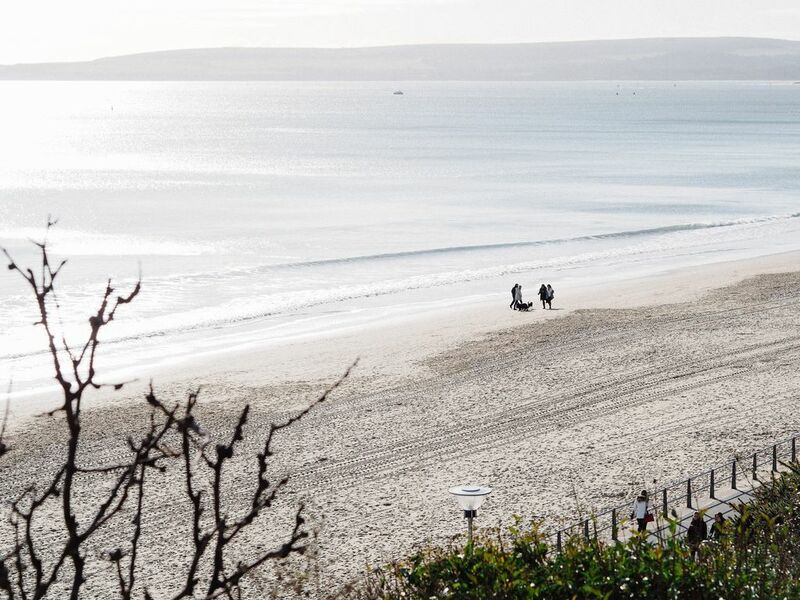 At the end of the day take your pick from numerous eateries including renowned pub/restaurant The Cliff, The plantation, Baffi's and of course the branksome beach cafe which sits directly on the beach-all within a 5 min walk from your apartment. If you enjoy a drink watching the sun go down pre dinner it doesn’t get anymore spectacular than the view at the Harbour Heights Hotel. If you choose to explore further afield the area is a great launch pad to enjoy the beauty of the new forest and its many attractions such as the new forest water park and Beaulieu Car Museum. Spend a day exploring and learning the history of Corfe Castle and take a ride on a steam train, take a boat to Brownsea Island nature reserve or simply enjoy the many and varied walks around the Jurrasic coast. Eat in, eat out, take in the sights, hit the shops or just lounge like a local and enjoy the luxury of your home. Your accommodation has been designed and organised in such a way that you will have complete privacy and no need to contact ourselves. Upon your arrival arrangements will be made for keys and access together with an extensive welcome brochure providing simple and easy information to permit you to enjoy a hassle free stay. A welcome pack awaits with provision of fresh quality coffee,tea, bread, milk, etc and an initial complementary supply of essentials such as toilet rolls, dishwasher tablets etc. Please note the front communal door requires a gentle pull towards you to assist with opening when turning key. Please note that all check ins are from 3pm onwards and check outs must take place at the latest by 10am as our cleaners are booked for 10am. Joanne’s home is located in Poole, England, United Kingdom. Situated in the heart of the exclusive Canford Cliffs and adjacent to the world renowned Sandbanks peninsular. Beach Retreat offers a luxurious pied a terre in which to explore the beauty of the area. Whilst sun, sea, sand and surf await, the area caters for so much more. Whether it be stunning beaches and sunsets, dramatic coastal walks, cosy cafes and fancy restaurants, spa treatments, boat trips or exploring nature’s wonders such as deer stalking and bird watching you will experience some of life’s simple pleasures which have made this area world famous. For those of you who enjoy a more active holiday, cycling, running, canoeing, paddle boarding, kite surfing, wind surfing, body boarding, sea swimming are readily available to enjoy within some breathtaking scenery and if you still have some energy left at the end of the day, why not try a local yoga class. Full details provided in welcome brochure/manual and available in the apartment upon your arrival. Your Beach Retreat awaits, relaxation, fine dinning experiences and memorable family times assured! Getting around The Beach Retreat location provides the ability to leave the car parked for the entire duration. Bike stands are provided in the porch and as an alternative to the many and varied walking routes on offer cycling is also a wonderful way to explore the beauty of the area. The Purbeck Breezer open top bus (number 50) picks up and drops off approximately 200 metres from the apartment and provides a unique experience in which to enjoy the stunning scenery of the area. This property sits adjacent to but completely independent of its sister property which is also available for rental, providing a further 2 bed apartment which may be of interest to those with larger families. Outstanding attention to detail and quality throughout, located in an upmarket, quiet road less than 5 minutes walk from numerous renowned eating and drinking establishments. 10min delightful woodland walk to the beach and adjacent to the world renowned Sandbanks peninsular. Discounts available for 7 night stays and longer. Beach Retreat won't disappoint! Please note that all check ins are from 3pm onwards and check outs must take place at the latest by 10am as our cleaners are booked for 10am. Stunning shower room and separate cloakroom all with high end Duravit fittings. Additional quality fold away single bed in main bedroom- please provide 7 days notice if required to enable assembly and fresh bed linen ready for your arrival. All feather free, highest quality. The hallway area provides a laundry cupboard housing a combined washer/dryer and night safe for your valuables. Also included is a small supply of washing powder. Upon initial arrival whilst an unloading of suitcases etc is possible in the main road, permanent free parking is provided 200metres down the road in The Cliff restaurant/pub car park. Delightful place, clean and characterful. Nice stroll to the beach too. We will be coming back! Water park in new forest. Great day out, just 45 min drive. breakfast, lunch or dinner, specialise with fish, just 5 min walk from apartment. Award winning forest adventure. 25 min drive from apartment. Famous for its woodland play and cycling trails, segway tours and enjoy the tree top adventures of taking on zip wires,Tarzan swings, rope ladders and numerous obstacles with over 1000 metres of exhilarating crossings, you will be swinging through the trees like a monkey! Country house with 130 acres of wonderful grounds to explore, great family day out. Segway rides available if you wish to explore at a slightly faster pace! childrens play/park area, steam train, cafe and restaurant, enjoyable area to walk around/picnic. Watch out for over friendly ducks.